Since its founding in 1939, the Baseball Hall of Fame and Museum, has experienced several instances of theft from its voluminous collection. The museum, which relies solely on donations from the public and other institutions, does not actively purchase artifacts to expand its collections. The first formally documented thefts occurred in the early 1970’s as four significant baseballs signed by US Presidents were stolen from the collection, and in the 1980’s numerous vintage World Series programs from the Hall of Fame collection mysteriously appeared for sale in the baseball collectibles marketplace. 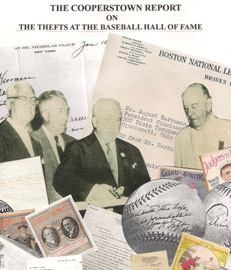 Although the Hall of Fame has since recovered the Presidential baseballs and replaced the World Series programs stolen from the collection, the news of the thefts occurring created significant scrutiny of the institution and its capability to secure donated items. While trying to avoid significant negative publicity related to the incidents of theft, the museum’s reputation was somewhat sullied as the security breaches were ultimately detrimental to the confidence of prospective individuals considering donating to the museum’s collection. Over the past few decades the security issues at the Hall of Fame have been vastly improved and the present leadership of the Hall of Fame has sufficiently re-addressed the museum’s dedication to safeguarding the donated treasures of the “National Pastime.” Unfortunately, however, additional instances of past thefts have failed to be properly pursued by the Hall of Fame and others have gone unreported. Many documents suspected to have originated from the Hall of Fame’s “August Herrmann Papers” archive have appeared in public auctions and sales. 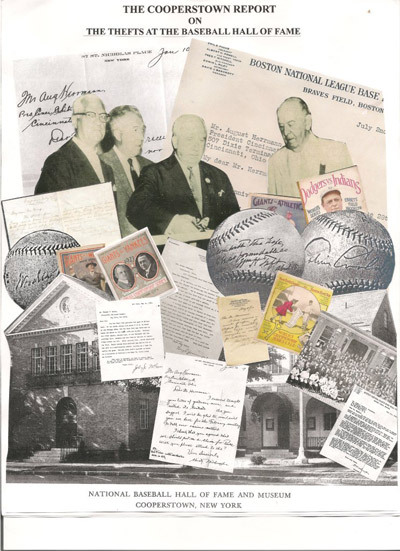 At present, there are numerous donated items from the Hall of Fame collection, which now reside in the collections of individual baseball memorabilia collectors.